Begining in 2003 as an inter-city project by Sam Genders, who lived in Derbyshire, with Mike Lindsay who was working in a studio in London, Tunng were essentially a duo with friends drifting in and out of the studio and pub contributing bits of this and that, eventually resulting in the deliciously strange ‘Mother’s Daughter And Other Songs’ album. When it came to time to “go public”, though, Sam stepped aside, remaining a silent partner, while a London-based line-up of Phil Winter (electronics and samples), Martin Smith (exotic percussion and the occasional clarinet), Ashley Bates (banjos and guitars) and Becky Jacobs (harmony vocals and melodica) gathered with Mike to recreate his and Sam’s songs on the stage. Despite everyone involved having musical projects of their own on the go, this loose set-up proved extremely durable, with album no.2 ‘Comments of the Inner Chorus’ written and toured in much the same fashion. 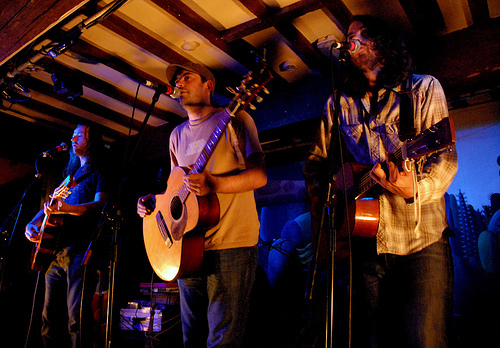 By 2007’s ‘Good Arrows’, however, life on the road had brought the musicians together, and very naturally the amount they played together began to be reflected in the way they worked in the studio: Tunng had become a band – and Sam, too, was drawn into this, joining the more collaborative writing process, and for the first time regularly being a part of the live performances – even as he was working the acoustic supergroup project The Accidental at the same time. Eventually, though, being a full-time part of a band wasn’t for the ever-independent Sam, and he once again stepped aside, this time completely. But the rest of the band were very definitely taken with the group musical identity that was continuing to develop, and as they came back together to assess their experiences of touring and things that were going on in their own lives – as Mike puts it, “everyday stuff and hedonistic adventures alike” – they realised they really wanted to put the full experience of Tunng on stage into the new record. The mission to establish this dynamic in a studio was a long one, though. Where previously the directness of capturing Mike and Sam’s songs on record – what Martin calls “snatched moments” – had been a rapid process, leading to three albums in three years, now experimentation and time was needed to make the collaborative process work. As all this was going on, all the members were “having adventures”, living their lives, growing up and bringing experiences back into the studio, which all added to the rich tangle of ideas that needed to be picked apart to find the new sound. Second was the entrance of long-time friend of the band Ben Bickerton as a contributor to lyrics. Ben had already contributed some lyrics to ‘Good Arrows’ but this time around he became, as Mike puts it, “almost a member”, working seriously on five or six songs, bouncing ideas back and forth with the band. “There was no particular agenda,” says Ben, “and no set way of working, but I was there to help develop the song words as the music developed.” With his input, the album’s richly-woven lyrics became a tapestry of images of travel and nautical life, allegories of adventure and discovery spilling from every song. The third and final impetus came just as the band were becoming frustrated with their writing producing nothing but, in Martin’s words “loads and loads of sketches” – and it was touring and recording with the Malian desert blues troupe Tinariwen in early 2009. “It was an adventure in itself,” says Mike, “and it shook us up and reminded us how good it was just to get up and play.” Re-energised and with new-found discipline, but still with the sense of democracy that came from being a full-blown band, they took to the studio again, and throughout the summer, hammered the album into shape. What emerged from that hammering is radically different from any of the previous three albums: for the most part the intimacy and domesticity of previous songs is replaced by a grand sweep, a feeling of a wide world being explored and alien experiences being processed and drawn into the band’s lives. It’s got a swagger in its step and a swing in its hips, it’s not afraid to kick up a jig and blow its own trumpet. And it’s got guitar solos. And yet it’s still Tunng, still with that bucolic oddness and modernist gleam that made those very first basement recordings so intriguing seven long, strange years ago. They were different then, and they remain very different now; still different, but still the same. That’s Tunng.